Gosh the excitement of being asked to shoot Lucy and Paul’s wedding at St Paul’s Cathedral! I’d been looking forward this warm sunny day in September since the begging of the year. Joined by Yasmin, our day started off by meeting Lucy and her bridesmaids at their home in Kent to capture some of their preparation. What a buzz of activity – excitable bridesmaids, make up and hair in full swing, flowers arriving – it’s great to capture this part of the story. 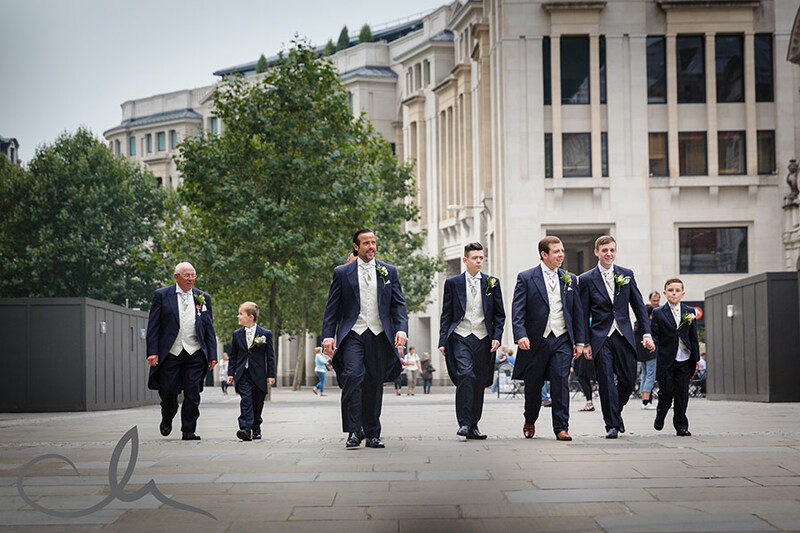 We then took ourselves off to meet up with Darren and his groomsmen outside the Cathedral. The scale of this remarkable building was breathtaking! Photography in the Cathedral is very limited, however we were able to sit at the back of the crypt and listen to their moving ceremony. One of the memorable moments was one of the Cathedral choristers singing as Darren and Lucy signed the register – truly spine tingling! After their ceremony in the crypt of St Paul’s Cathedral and some group shots, Lucy and Darren held their reception celebrations at the nearby very stylish wine bar Corney and Barrow at Paternoster Square. I loved the way the tables were decorated – very elegant. It was such a lovely relaxed reception. After the speeches, we ventured over the Millennium Bridge for some portrait shots – Darren and Lucy were such good sports and they weren’t deterred by being center of attention! What a special day. Darren and Lucy were super lovely to work with (thank you for all the cake!) and it was fantastic for us to be part of their intimate wedding and celebrations. Huge thanks to Yasmin for your help on the big day, as usual, you were fantastic! !